Japanese cuisine encompasses the regional and traditional foods of Japan, which have developed through centuries of political, economic, and social changes. The traditional cuisine of Japan (和食, washoku) is based on rice with miso soup and other dishes; there is an emphasis on seasonal ingredients. Side dishes often consist of fish, pickled vegetables, and vegetables cooked in broth. Seafood is common, often grilled, but also served raw as sashimi or in sushi. Seafood and vegetables are also deep-fried in a light batter, as tempura. Apart from rice, staples include noodles, such as soba and udon. Japan also has many simmered dishes such as fish products in broth called oden, or beef in sukiyaki and nikujaga. Historically influenced by Chinese cuisine, Japanese cuisine has also opened up to influence from Western cuisines in the modern era. Dishes inspired by foreign food—in particular Chinese food— like ramen and gyōza, as well as foods like spaghetti, curry, and hamburgers have become adopted with variants for Japanese tastes and ingredients. Traditionally, the Japanese shunned meat due to Buddhism, but with the modernization of Japan in the 1880s, meat-based dishes such as tonkatsu and yakiniku have become common. Japanese cuisine, particularly sushi, has become popular throughout the world. In 2011, Japan overtook France to become the country with the most 3-starred Michelin restaurants; as of 2018, the capital Tokyo has maintained the title of being the city with the most 3-starred restaurants in the world. Japanese cuisine is based on combining the staple food, which is steamed white rice or gohan (御飯), with one or several okazu or main dishes and side dishes. This may be accompanied by a clear or miso soup and tsukemono (pickles).The phrase ichijū-sansai (一汁三菜, "one soup, three sides") refers to the makeup of a typical meal served, but has roots in classic kaiseki, honzen, and yūsoku cuisine. The term is also used to describe the first course served in standard kaiseki cuisine nowadays. Rice is served in its own small bowl (chawan), and each main course item is placed on its own small plate (sara) or bowl (hachi) for each individual portion. This is done even in Japanese homes. It contrasts with the Western-style dinners at home, where each individual takes helpings from the large serving dishes of food presented at the middle of the dining table. Japanese style traditionally abhors different flavored dishes touching each other on a single plate, so different dishes are given their own individual plates as mentioned, or are partitioned using leaves, etc. Placing main dishes on top of rice and "soiling" it is also frowned upon by old-fashioned etiquette. Though this tradition originated from Classical Chinese dining formalities, especially after the adoption of Buddhism with its tea ceremony, it became most popular and common during and after the Kamakura period, such as the Kaiseki. Japanese cuisine keeps such tradition still, whereas in modern times such practice is in sharp contrast to present day Chinese cuisine, where placing food on rice is standard. However, an exception is the popular donburi. The small rice bowl or chawan (lit. "tea bowl") doubles as a word for the large tea bowls in tea ceremonies. Thus in common speech, the drinking cup is referred to as yunomi-jawan or yunomi for the purpose of distinction. In the olden days, among the nobility, each course of a full-course Japanese meal would be brought on serving napkins called zen (膳), which were originally platformed trays or small dining tables. In the modern age, faldstool trays or stackup-type legged trays may still be seen used in zashiki, i.e. tatami-mat rooms, for large banquets or at a ryokan type inn. Some restaurants might use the suffix -zen (膳) as a more sophisticated though dated synonym to the more familiar teishoku (定食), since the latter basically is a term for a combo meal served at a taishū-shokudō, akin to a diner. Teishoku means a meal of fixed menu, a dinner à prix fixe served at shokudō (食堂, "dining hall") or ryōriten (料理店, "restaurant"), which is somewhat vague (shokudō can mean a diner-type restaurant or a corporate lunch hall); but e.g. Ishikawa, Hiroyoshi (石川弘義) (1991). Taishū bunka jiten (snippet). Kōbundō. p. 516. defines it as fare served at teishoku dining hall (定食食堂, teishoku-shokudō), etc., a diner-like establishment. About 2000 years ago, Japanese cuisine was developed with the influence of Korea and China. Rice is a staple in Japanese cuisine, because it is the main ingredient for making sushi. Between 300 and 100 B.C. (Heian Period), Rice was widely used in Japan because of its influences from Korea. After the introduction of rice, wheat and soybeans were also soon introduced. All three of these ingredients act as a huge foundation of Japanese cuisine today. During the Kofun period, Buddhism became the official religion of the country. Therefore, eating of any meat and fish were prohibited ever since. In 675 AD, an Emperor named Tenmu prohibited the eating any of horses, dogs, monkeys, and chickens (83). In the 8th and 9th century, many emperors have continued prohibited killing of a lot of animals. The number of regulated meats increased significantly, it went to the point that they banned all mammals except whale which were categorized as fish (84). During this period, chopsticks were also introduced in Japan. However, chopsticks were only used by nobility at that time (85). The general population used their hands as utensils since utensils were quite expensive back then. From the lack of meat products, Japanese people minimized spice utilization. Spices were rare to find back in the day. Spices like pepper and garlic were only used in a minimalistic amount. In absence of any meat, fish was served as a substitute as the main protein. Fish is quite in Japan since Japan is located on an island next to the ocean. Fish has influenced many iconic Japanese dishes nowadays. In the 9th century, grilled fish and sliced raw fish were widely popular (86). Japanese people would eat fish in every one of their meals. In traditional Japanese cuisine, oil and fat are usually avoided within the cooking process, because Japanese people were trying to keep a healthy lifestyle (86). Preserving fish became a sensation; sushi was originated as means of preserving fish by fermenting it in boiled rice. Fish that are salted and then placed in rice are preserved by lactic acid fermentation, which helps prevent proliferation of the bacteria that bring about putrefaction (87). During the 15th century, advancement and development helped shorten the fermentation of sushi to about one to two weeks. Because of this reason, sushi became a popular snack food and main entrée, combining fish with rice. During the Tokugawa period (mid 15th century), sushi without fermentation was first introduced. Sushi was still being consumed without fermentation till the end of 18th century when the hand-rolled and nigri-type sushi was invented (88). In 1854, Japan started to gain new trade deals with the Western countries when a new Japanese ruling order took over the old emperor. Emperor Meiji, the new ruler, staged a New Years feast designed to embrace the Western world and countries in 1872. The feast contained food that had a lot of European emphasis (88). For the first time in a thousand years, people finally were allowed to consume meat in public. After this New Years feast, general population from Japan started to consume meat again. Emphasis is placed on seasonality of food or shun (旬), and dishes are designed to herald the arrival of the four seasons or calendar months. Seasonality means taking advantage of the "fruit of the mountains" (山の幸, yama no sachi, alt. "bounty of the mountains") (e.g. bamboo shoots in spring, chestnuts in the autumn) as well as the "fruit of the sea" (海の幸, umi no sachi, alt. "bounty of the sea") as they come into season. Thus the first catch of skipjack tunas (初鰹, hatsu-gatsuo) that arrives with the Kuroshio Current has traditionally been greatly prized. If something becomes available rather earlier than what is usual for the item in question, the first crop or early catch is called hashiri. Use of (inedible) tree leaves and branches as decor is also characteristic of Japanese cuisine. Maple leaves are often floated on water to exude coolness or ryō (涼); sprigs of nandina are popularly used. The haran (Aspidistra) and sasa bamboo leaves were often cut into shapes and placed underneath or used as separators. A characteristic of traditional Japanese food is the sparing use of red meat, oils and fats, and dairy products. Use of ingredients such as soy sauce, miso, and umeboshi tends to result in dishes with high salt content, though there are low-sodium versions of these available. As Japan is an island nation surrounded by an ocean, its people have always taken advantage of the abundant seafood supply. It is the opinion of some food scholars that the Japanese diet always relied mainly on "grains with vegetables or seaweeds as main, with poultry secondary, and red meat in slight amounts" even before the advent of Buddhism which placed an even stronger taboo. The eating of "four-legged creatures" (四足, yotsuashi) was spoken of as taboo, unclean or something to be avoided by personal choice through the Edo period. The consumption of whale and terrapin meat were not forbidden under this definition. Despite this, the consumption of red meat did not completely disappear in Japan. Eating wild game—as opposed to domesticated livestock—was tolerated; in particular, trapped hare was counted using the measure word wa (羽), a term normally reserved for birds. Vegetable consumption has dwindled while processed foods have become more prominent in Japanese households due to the rising costs of general foodstuffs. Nonetheless, Kyoto vegetables, or Kyoyasai, are rising in popularity and different varieties of Kyoto vegetables are being revived. Generally speaking, traditional Japanese cuisine is prepared with little cooking oil. A major exception is the deep-frying of foods. This cooking method was introduced during the Edo period due to influence from Western (formerly called nanban-ryōri (南蛮料理)) and Chinese cuisine, and became commonplace with the availability of cooking oil due to increased productivity. Dishes such as tempura, aburaage, and satsuma age are now part of established traditional Japanese cuisine. Words such as tempura or hiryōzu (synonymous with ganmodoki) are said to be of Portuguese origin. Also, certain homey or rustic sorts of traditional Japanese foods such as kinpira, hijiki, and kiriboshi daikon usually involve stir-frying in oil before stewing in soy sauce. Some standard osōzai or obanzai dishes feature stir-fried Japanese greens with either age or chirimen-jako [ja], dried sardines. Once a main dish has been cooked, spices such as minced ginger and various pungent herbs may be added as a garnish, called tsuma. With certain milder items, a dollop of wasabi and grated daikon (daikon-oroshi), or Japanese mustard are provided as condiments. A sprig of mitsuba or a piece of yuzu rind floated on soups are called ukimi. Minced shiso leaves and myoga often serve as yakumi, a type of condiment paired with tataki of katsuo or soba. Finally, a dish may be garnished with minced seaweed in the form of crumpled nori or flakes of aonori. Shichimi is also a very popular spice mixture often added to soups, noodles and rice cakes. Shichimi is a chilli based spice mix which contains seven spices: chilli, sansho, orange peel, black sesame, white sesame, hemp, ginger, and nori. In the aforementioned stock phrase ichijū-sansai (一汁三菜, "one soup, three sides"), the word sai (菜) has the basic meaning of "vegetable", but secondarily means any accompanying dish including fish or meat. It figures in the Japanese word for appetizer, zensai (前菜); main dish, shusai (主菜); or sōzai (惣菜) (formal synonym for okazu - considered somewhat of a housewife's term). The o-hitashi or hitashi-mono (おひたし) is boiled green-leaf vegetables bunched and cut to size, steeped in dashi broth, eaten with dashes of soy sauce. Another item is sunomono (酢の物, "vinegar item"), which could be made with wakame seaweed, or be something like a kōhaku namasu (紅白なます, "red white namasu") made from thin toothpick slices of daikon and carrot. The so-called vinegar that is blended with the ingredient here is often sanbaizu [ja] (三杯酢, "three cupful/spoonful vinegar") which is a blend of vinegar, mirin, and soy sauce. A tosazu [ja] (土佐酢, "Tosa vinegar") adds katsuo dashi to this. Note sparing use of oil, compared with Western salads. An aemono [ja] (和え物)[dead link]is another group of items, describable as a sort of "tossed salad" or "dressed" (though aemono also includes thin strips of squid or fish sashimi (itozukuri) etc. similarly prepared). One types are goma-ae (胡麻和え) where usually vegetables such as green beans are tossed with white or black sesame seeds ground in a suribachi mortar bowl, flavored additionally with sugar and soy sauce. Shira-ae (白和え) adds tofu (bean curd) in the mix. An aemono is tossed with vinegar-white miso mix and uses wakegi scallion and baka-gai (バカガイ / 馬鹿貝, a trough shell (Mactra sinensis) as standard. Different cooking techniques are applied to each of the three okazu; they may be raw (sashimi), grilled, simmered (sometimes called boiled), steamed, deep-fried, vinegared, or dressed. delicacies, food of delicate flavor (chinmi 珍味). Kaiseki, closely associated with tea ceremony (chanoyu), is a high form of hospitality through cuisine. The style is minimalist, extolling the aesthetics of wabi-sabi. Like the tea ceremony, appreciation of the diningware and vessels is part of the experience. In the modern standard form, the first course consists of ichijū-sansai (one soup, three dishes), followed by the serving of sake accompanied by dish(es) plated on a square wooden bordered tray of sorts called hassun (八寸). Sometimes another element called shiizakana (強肴) is served to complement the sake, for guests who are heavier drinkers. The tea ceremony kaiseki(懐石) is often confounded with another kaiseki-ryōri (会席料理), which is an outgrowth of meals served at a gathering for haiku and renga composition, which turned into a term for sumptuous sake-accompanied banquet, or shuen (酒宴). Strictly vegetarian food is rare since even vegetable dishes are flavored with the ubiquitous dashi stock, usually made with katsuobushi (dried skipjack tuna flakes), and are therefore pescetarian more often than carnivorous. An exception is shōjin-ryōri (精進料理), vegetarian dishes developed by Buddhist monks. However, the advertised shōjin-ryōri at public eating places includes some non-vegetarian elements. Regarding vegetarianism, fucha-ryōri [ja] (普茶料理) was introduced from China by the Ōbaku sect (a sub-sect of Zen Buddhism), and which some sources still regard as part of "Japanese cuisine". The sect in Japan was founded by the priest Ingen (d. 1673), and is headquartered in Uji, Kyoto. The Japanese name for the common green bean takes after this priest who allegedly introduced the New World crop via China. One aspect of the fucha-ryōri practiced at the temple is the wealth of modoki-ryōri (もどき料理, "mock foods"), one example being mock-eel, made from strained tofu, with nori seaweed used expertly to mimic the black skin. The secret ingredient used is grated gobō (burdock) roots. Dr. Masakazu Tada, Honorary Vice-President of the International Vegetarian Union for 25 years from 1960, stated that "Japan was vegetarian for a 1,000 years". Although this is not totally true, British journalist J. W. Robertson Scott reported in the 1920s that the society was 90% vegetarian. 50–60% of the population ate fish only on festive occasions, probably more because of poverty than for any other reason. Gyūdon beef rice bowl (right) and niku shoyu ramen beef noodle (left). Rice has been the staple food for the Japanese historically. Its fundamental importance is evident from the fact that the word for cooked rice, gohan and meshi, also stands for a "meal". While rice has a long history of cultivation in Japan, its use as a staple has not been universal. Notably, in northern areas (northern Honshū and Hokkaidō), other grain such as wheat were more common into the 19th century. In most of Japan, rice used to be consumed for almost every meal, and although a 2007 survey showed that 70% of Japanese still eat it once or twice a day, its popularity is now declining. In the 20th century there has been a shift in dietary habits, with an increasing number of people choosing wheat based products (such as bread and noodles) over rice. Japanese rice is short-grained and becomes sticky when cooked. Most rice is sold as hakumai (白米, "white rice"), with the outer portion of the grains (糠, nuka) polished away. Unpolished brown rice (玄米, genmai) is considered less desirable, but its popularity has been increasing. Japanese noodles often substitute for a rice-based meal. Soba (thin, grayish-brown noodles containing buckwheat flour) and udon (thick wheat noodles) are the main traditional noodles, while ramen is a modern import and now very popular. There are also other, less common noodles. Japanese noodles, such as soba and udon, are eaten as a standalone, and usually not with a side dish, in terms of general custom. It may have toppings, but they are called gu (具). The fried battered shrimp tempura sitting in a bowl of tempura-soba would be referred to as "the shrimp" or "the tempura", and not so much be referred to as a topping (gu). The identical toppings, if served as a dish to be eaten with plain white rice could be called okazu, so these terms are context-sensitive. Hot noodles are usually served in a bowl already steeped in their broth and are called kakesoba or kakeudon. Cold soba arrive unseasoned and heaped atop a zaru or seiro, and are picked up with a chopstick and dunked in their dip sauce. The broth is a soy-dashi-mirin type of mix; the dip is similar but more concentrated (heavier on soy sauce). In the simple form, yakumi (condiments and spices) such as shichimi, nori, finely chopped scallions, wasabi, etc. are added to the noodles, besides the broth/dip sauce. Udon may also be eaten in kama-age style, piping hot straight out of the boiling pot, and eaten with plain soy sauce and sometimes with raw egg also. Traditional Japanese sweets are known as wagashi. Ingredients such as red bean paste and mochi are used. More modern-day tastes includes green tea ice cream, a very popular flavor. Almost all manufacturers produce a version of it. Kakigōri is a shaved ice dessert flavored with syrup or condensed milk. It is usually sold and eaten at summer festivals. A dessert very popular among the children in Japan are dorayaki. They are sweet pancakes filled with a sweet red bean paste. They are mostly eaten at room temperature but are also considered very delicious hot. See also the list of sweets. Green tea may be served to most japanese dishes. It is produced in Japan and prepared in various forms such as matcha, the tea used in the Japanese tea ceremony. Beer production started in Japan in the 1860s. The most commonly consumed beers in Japan are pale-colored light lagers, with an alcohol strength of around 5.0% ABV. Lager beers are the most commonly produced beer style in Japan, but beer-like beverages, made with lower levels of malts called Happoshu (発泡酒, literally, "bubbly alcohol") or non-malt Happousei (発泡性, literally "effervescence") have captured a large part of the market as tax is substantially lower on these products. Beer and its varieties have a market share of almost 2/3 of alcoholic beverages. Small local microbreweries have also gained increasing popularity since the 1990s, supplying distinct tasting beers in a variety of styles that seek to match the emphasis on craftsmanship, quality, and ingredient provenance often associated with Japanese food. Sake is a brewed rice beverage that typically contains 15%–17% alcohol and is made by multiple fermentation of rice. At traditional formal meals, it is considered an equivalent to rice and is not simultaneously taken with other rice-based dishes, although this notion is typically no longer applied to modern, refined, premium ("ginjo") sake, which bear little resemblance to the sakes of even 100 years ago. Side dishes for sake are particularly called sakana or otsumami. Sake is brewed in a highly labor-intensive process more similar to beer production than winemaking, hence, the common description of sake as rice "wine" is misleading. Sake is made with, by legal definition, strictly just four ingredients: special rice, water, koji, and special yeast. As of 2014, Japan has some 1500 registered breweries, which produce thousands of different sakes. Sake characteristics and flavor profiles vary with regionality, ingredients, and the styles (maintained by brewmaster guilds) that brewery leaders want to produce. Sake flavor profiles lend extremely well to pairing with a wide variety of cuisines, including non-Japanese cuisines. Shōchū is a distilled spirit that is typically made from barley, sweet potato, buckwheat, or rice. Shōchū is produced everywhere in Japan, but its production started in Kyushu. Japanese whisky began commercial production in the early 20th century, and is now extremely popular, primarily consumed in highballs (ハイボール, haibōru). It is produced in the Scottish style, with malt whisky produced since the 1980s, and has since won top international awards, since the 2000s. A domestic wine production exists since the 1860s yet most wine is imported. The total market share of wine on alcoholic beverages is about 3%. Japanese cuisine offers a vast array of regional specialties known as kyōdo-ryōri (郷土料理), many of them originating from dishes prepared using traditional recipes with local ingredients. Foods from the Kantō region taste very strong. For example, the dashi-based broth for serving udon noodles is heavy on dark soy sauce, similar to soba broth. On the other hand, Kansai region foods are lightly seasoned, with clear udon noodles. made with light soy sauce. The traditional Japanese table setting has varied considerably over the centuries, depending primarily on the type of table common during a given era. Before the 19th century, small individual box tables (hakozen, 箱膳) or flat floor trays were set before each diner. Larger low tables (chabudai, ちゃぶ台) that accommodated entire families were gaining popularity by the beginning of the 20th century, but these gave way to Western-style dining tables and chairs by the end of the 20th century. Traditional Japanese table setting is to place a bowl of rice on your left and to place a bowl of miso soup on your right side at the table. Behind these, each okazu is served on its own individual plate. Based on the standard three okazu formula, behind the rice and soup are three flat plates to hold the three okazu; one to far back left, one at far back right, and one in the center. Pickled vegetables are often served on the side but are not counted as part of the three okazu. Chopsticks are generally placed at the very front of the tray near the diner with pointed ends facing left and supported by a chopstick rest, or hashioki. Many restaurants and homes in Japan are equipped with Western-style chairs and tables. However, traditional Japanese low tables and cushions, usually found on tatami floors, are also very common. Tatami mats, which are made of straw, can be easily damaged and are hard to clean, thus shoes or any type of footwear are always taken off when stepping on tatami floors. When dining in a traditional tatami room, sitting upright on the floor is common. In a casual setting, men usually sit with their feet crossed and women sit with both legs to one side. Only men are supposed to sit cross-legged. The formal way of sitting for both sexes is a kneeling style known as seiza. To sit in a seiza position, one kneels on the floor with legs folded under the thighs and the buttocks resting on the heels. When dining out in a restaurant, the customers are guided to their seats by the host. The honored or eldest guest will usually be seated at the center of the table farthest from the entrance. In the home, the most important guest is also seated farthest away from the entrance. If there is a tokonoma, or alcove, in the room, the guest is seated in front of it. The host sits next to or closest to the entrance. In Japan, it is customary to say itadakimasu ("I [humbly] receive") before starting to eat a meal. When saying itadakimasu, both hands are put together in front of the chest or on the lap. Itadakimasu is preceded by complimenting the appearance of food. The Japanese attach as much importance to the aesthetic arrangement of the food as its actual taste. Before touching the food, it is polite to compliment the host on his artistry. It is also a polite custom to wait for the eldest guest at the table to start eating before the other diners start. Another customary and important etiquette is to say go-chisō-sama deshita ("It was a feast") to the host after the meal and the restaurant staff when leaving. Before eating, most dining places provide either a hot or cold towel or a plastic-wrapped wet napkin (o-shibori). This is for cleaning hands before eating (and not after). It is rude to use them to wash the face or any part of the body other than the hands, though some Japanese men use their o-shibori to wipe their faces in less formal places. Accept o-shibori with both hands when handed the towel by a server. When finished, fold or roll up the oshibori and place it on the table. It is impolite to use o-shibori towels to wipe any spills on the table. The rice or the soup is eaten by picking up the bowl with the left hand and using chopsticks (hashi) with the right, or vice versa if one is left-handed. Traditionally, chopsticks were held in the right hand and the bowl in the left. Japanese children were taught to distinguish left from right as "the right hand holds the chopsticks, the left hand holds the bowl" – but left-handed eating is acceptable today. Bowls may be lifted to the mouth, but should not be touched by the mouth except when drinking soup. The Japanese customarily slurp noodle soup dishes like ramen, udon, and soba. When slurping noodles quickly, the soup clings to the noodles, making the dish more flavourful. 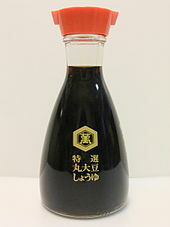 Soy sauce (shōyu) is not usually poured over most foods at the table; a dipping dish is usually provided. Soy sauce is, however, meant to be poured directly onto tōfu and grated daikon dishes, and in the raw egg when preparing tamago kake gohan ("egg on rice"). Hold chopsticks towards their end, and not in the middle or the front third. Chopsticks not in use should be laid down in front of the meal with the tip to the left. This is also the correct position in which to place chopsticks after the meal's conclusion. Do not pass food with chopsticks directly to somebody else's chopsticks. This technique is only used at funerals, where the bones of the cremated body of the dead person are passed from person to person in this manner. Do not move chopsticks around in the air too much or play with them. To separate a piece of food into two pieces, exert controlled pressure on the chopsticks while moving them apart from each other. When taking food from a communal dish, unless they are family or very close friends, one should turn the chopsticks around to grab the food; it is considered more sanitary. Alternatively, one could have a separate set of chopsticks for communal dishes. It is customary to eat rice to the last grain. Being a picky eater is frowned upon, and it is not customary to ask for special requests or substitutions at restaurants. It is considered ungrateful to make these requests especially in circumstances where one is being hosted, as in a business dinner environment. After eating, try to move all dishes back to the same position they were at the start of the meal. This includes replacing the lids on dishes and putting one's chopsticks on the chopstick holder or back into their paper slip. Good manners dictate that one respects the selections of the host. However, this can be set aside for a diner with allergies such as a peanut allergy, or a religious prohibition against certain foods like pork. Even in informal situations, drinking alcohol starts with a toast (kanpai, 乾杯) when everyone is ready. Do not start drinking until everybody is served and has finished the toast. It is not customary to pour oneself a drink; rather, people are expected to keep each other's drinks topped up. When someone moves to pour one's drink, one should hold one's glass with both hands and thank the pourer. Botamochi, a sticky rice dumpling with sweet azuki paste served in spring, while a similar sweet Ohagi is served in autumn. Chimaki (steamed sweet rice cake): Tango no sekku and Gion Festival. Hamo (a type of fish, often eel) and sōmen: Gion Festival. Sekihan, is red rice, which is served for any celebratory occasion. It is usually sticky rice cooked with azuki, or red bean, which gives the rice its distinctive red color. Soba: New Year's Eve. This is called toshi koshi soba (ja:年越しそば) (literally "year crossing soba"). Chirashizushi, Ushiojiru (clear soup of clams) and amazake: Hinamatsuri. In some regions every 1st and 15th day of the month people eat a mixture of rice and azuki (azuki meshi (小豆飯), see Sekihan). Japan has a long history of importing food from other countries, some of which are now part of Japan's most popular cuisine. Ramen is considered an important part to their culinary history, to the extent where in survey of 2,000 Tokyo residents, instant ramen came up many times as a product they thought was an outstanding Japanese invention. Believed to have originated in China, Ramen became popular in Japan after the Second Sino-Japanese war (1937-1945), when many Chinese students were displaced to Japan. Curry is so widely consumed that it can be called a national dish. Curry is another popular imported dish and is ranked near the top of nearly all Japanese surveys for favorite foods. The average Japanese eats curry at least once a week. The origins of curry, as well many other foreign imports such as pan or bread are linked to the emergence of Yōshoku, or western cuisine. Yōshoku can be traced as far back as the late Muromachi period (1336-1573) during a culinary revolution called namban ryori (南蛮料理), which means “Southern barbarian cooking”, as it is rooted in European cuisine. This cuisine style was first seen in Nagasaki, which served as the point of contact between Europe and Japan at that point in time. Food items such as potatoes, corn, dairy products, as well as the hard candy kompeito (金平糖), spread during this time. This cuisine became popular in the Meiji period, which is considered by many historians to be when Japan first opened itself to the outside world. Today, many of these imported items still hold a heavy presence in Japan. Japan today abounds with home-grown, loosely Western-style food. Many of these were invented in the wake of the 1868 Meiji Restoration and the end of national seclusion, when the sudden influx of foreign (in particular, Western) culture led to many restaurants serving Western food, known as yōshoku (洋食), a shortened form of seiyōshoku (西洋食, "Western cuisine"), opening up in cities. Restaurants that serve these foods are called yōshokuya (洋食屋, "Western cuisine restaurants"). Many yōshoku items from that time have been adapted to a degree that they are now considered Japanese and are an integral part of any Japanese family menu. Many are served alongside rice and miso soup, and eaten with chopsticks. Yet, due to their origins these are still categorized as yōshoku as opposed to the more traditional washoku (和食, "Japanese cuisine"). Okonomiyaki is a savoury pancake containing a variety of ingredients. 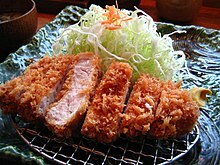 Tonkatsu is a breaded, deep-fried pork cutlet. Curry was introduced to Japan by the British in the Meiji period. Japanese versions of curry can be found in foods such as curry udon, curry bread, and katsukarē, tonkatsu served with curry. They very commonly come with rice beside the curry on the dish. This can be eaten during dinner most of the time. Chinese-style wheat noodles served in a meat stock broth known as ramen have become extremely popular over the last century. Hamburger chains include McDonald's, Burger King, First Kitchen, Lotteria and MOS Burger. Many chains developed uniquely Japanese versions of American fast food such as the teriyaki burger, kinpira(sauté )rice burger, fried shrimp burgers, and green tea milkshakes. High-class Japanese chefs have preserved many Italian seafood dishes that are forgotten in other countries. These include pasta with prawns, lobster (a specialty known in Italy as pasta all'aragosta), crab (an Italian specialty; in Japan it is served with a different species of crab), and pasta with sea urchin sauce (sea urchin pasta being a specialty of the Puglia region). California roll, a fusion makizushi created outside of Japan. Many countries have imported portions of Japanese cuisine. Some may adhere to the traditional preparations of the cuisines, but in some cultures the dishes have been adapted to fit the palate of the local populace. In 1970s sushi travelled from Japan to Canada and the United States, it was modified to suit the American palate, and re-entered the Japanese market as "American Sushi". An example of this phenomenon is the California roll, which was created in North America in the 1970s, rose in popularity across the United States through the 1980s, and thus sparked Japanese food's – more precisely, sushi's – global popularity. In 2014, Japanese Restaurant Organization has selected potential countries where Japanese food is becoming increasingly popular, and conducted research concerning the Japanese restaurants abroad. These key nations or region are Taiwan, Hong Kong, China, Singapore, Thailand and Indonesia. This was meant as an effort to promote Japanese cuisine and to expand the market of Japanese ingredients, products and foodstuffs. Numbers of Japanese foodstuff and seasoning brands such as Ajinomoto, Kikkoman, Nissin and Kewpie mayonnaise, are establishing production base in other Asian countries, such as China, Thailand and Indonesia. Japan and Taiwan have shared close historical and cultural relations. Taiwan has adapted many Japanese food items. Tianbula, a Taiwanese version of tempura, only barely resembles the original, being more a variant of oden. Taiwanese Tianbula is prepared by boiling fish paste, dicing it into small pieces, and then coating it lightly with sweet chili sauce. Taiwanese versions of oden are known locally as olen. Ramen has been exported back to China in recent years where it is known as ri shi la mian (日式拉麵, "Japanese lamian"). Japanese ramen chains serve ramen alongside distinctly Japanese dishes such as tempura and yakitori. Skewered versions of oden is a common convenience store item in Shanghai where it is known as guandongzhu (关东煮). In Southeast Asia, Thailand is the largest market for Japanese food. This is partly because Thailand is a popular tourist destination, having large numbers of Japanese expatriats, as well as local population has developed a taste for authentic Japanese cuisine. According to the Organisation that Promote Japanese Restaurants Abroad (JRO), the number of Japanese restaurants in Thailand jumped about 2.2-fold from 2007's figures to 1,676 in June 2012. In Bangkok, Japanese restaurants accounts for 8.3 percent of all restaurants, following those that serve Thai. Numbers of Japanese chain restaurants has established their business in Thailand, such as Yoshinoya gyūdon restaurant chain, Gyu-Kaku yakiniku restaurant chain and Kourakuen ramen restaurant chain. Chicken teriyaki bento set, including salmon sashimi, gyoza, salad and miso soup, served in a Japanese restaurant in Jakarta. In the ASEAN region, Indonesia is the second largest market for Japanese food, after Thailand. Japanese cuisine has been increasingly popular as the growth of the Indonesian middle-class expecting higher quality foods. This is also contributed to the fact that Indonesia has large numbers of Japanese expatriates. The main concern is the halal issue. As a Muslim majority country, Indonesians expected that Japanese food served there are halal according to Islamic dietary law, which means no pork and alcohol allowed. Japanese restaurants in Indonesia often offer a set menu which include rice served with an array of Japanese favourites in a single setting. 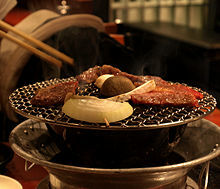 A set menu might include a choice of yakiniku or sukiyaki, including a sample of sushi, tempura, gyoza and miso soup. Quite authentic Japanese style izakaya and ramen shops can be found in Little Tokyo (Melawai) area in Blok M, South Jakarta, serving both Japanese expats and local clienteles. Today, Japanese restaurants can be found in most of Indonesian major cities, with high concentration in Greater Jakarta area, Bandung, Surabaya and Bali. In some cases, Japanese cuisine in Indonesia is often slanted to suit Indonesian taste. Hoka Hoka Bento in particular is an Indonesian-owned Japanese fast food restaurant chain that cater to the Indonesian clientele. As a result the foods served there have been adapted to suit Indonesians' taste. Examples of the change include stronger flavours compared to the authentic subtle Japanese taste, the preference for fried food, as well as the addition of sambal to cater to the Indonesians' preference for hot and spicy food. Japanese food popularity also had penetrated street food culture, as modest Warjep or Warung Jepang (Japanese food stall) offer Japanese food such as tempura, okonomiyaki and takoyaki, at very moderately low prices. Today, okonomiyaki and takoyaki are popular street fare in Jakarta and other Indonesian cities. This is also pushed further by the Japanese convenience stores operating in Indonesia, such as 7-Eleven and Lawson offering Japanese favourites such as oden, chicken katsu (deep-fried chicken cutlet), chicken teriyaki and onigiri. Some chefs in Indonesian sushi establishment has created a Japanese-Indonesian fusion cuisine, such as krakatau roll, gado-gado roll, rendang roll and gulai ramen. The idea of fusion cuisine between spicy Indonesian Padang and Japanese cuisine was thought because both cuisine traditions are well-liked by Indonesians. Nevertheless, some of these Japanese eating establishments might strive to serve authentic Japanese cuisine abroad. Numbers of Japanese chain restaurants has established their business in Indonesia, such as Yoshinoya gyūdon restaurant chain, Gyu-Kaku yakiniku restaurant chain and Ajisen Ramen restaurant chain. In the Philippines, Japanese cuisine is also popular among the local population. The Philippines have been exposed to the influences from the Japanese, Indian and Chinese. The cities of Davao and Metro Manila probably have the most Japanese influence in the country. The popular dining spots for Japanese nationals are located in Makati City, which is called as "Little Tokyo", a small area filled with restaurants specializing in different types of Japanese food. Some of the best Japanese no-frills restaurants in the Philippines can be found in Makati's "Little Tokyo" area. Japanese cuisine is very popular in Australia, and Australians are becoming increasingly familiar with traditional Japanese foods. Restaurants serving Japanese cuisine feature prominently in popular rankings, including Gourmet Traveller and The Good Food Guide. Sushi in particular has been described as being "as popular as sandwiches", particularly in large cities like Melbourne, Sydney, or Brisbane. As such, sushi bars are a mainstay in shopping centre food courts, and are extremely common in cities and towns all over the country. Japanese food restaurant chains in the UK include Wagamama, YO! Sushi, Nudo Sushi Box, Wasabi and Kokoro. In Canada, Japanese cuisine has become quite popular. Sushi, sashimi, and instant ramen are highly popular at opposite ends of the income scale, with instant ramen being a common low-budget meal. Sushi and sashimi takeout began in Vancouver and Toronto, and is now common throughout Canada. The largest supermarket chains all carry basic sushi and sashimi, and Japanese ingredients and instant ramen are readily available in most supermarkets. Most mid-sized mall food courts feature fast-food teppan cooking. Izakaya restaurants have surged in popularity. The Canada-born popular makizushi California roll has been influential in sushi's global popularity; as of 2015[update] the country has about 4,200 sushi restaurants. It is one of the most popular styles of sushi in the US market. Japanese cuisine is an integral part of food culture in Hawaii as well as in other parts of the United States. Popular items are sushi, sashimi, and teriyaki. Kamaboko, known locally as fish cake, is a staple of saimin, a noodle soup. Sushi, long regarded as quite exotic in the west until the 1970s, has become a popular health food in parts of North America, Western Europe and Asia. Two of the first Japanese restaurants in the United States were Saito and Nippon. Restaurants such as these popularized dishes such as sukiyaki and tempura, while Nippon was the first restaurant in Manhattan to have a dedicated sushi bar. Nippon was also one of the first Japanese restaurants in the U.S. to grow and process their own soba and responsible for creation of the now standard beef negimayaki dish. In Mexico, certain Japanese restaurants have created what is known as "sushi Mexicano", in which spicy sauces and ingredients accompany the dish or are integrated in sushi rolls. The habanero and serrano chiles have become nearly standard and are referred to as chiles toreados, as they are fried, diced and tossed over a dish upon request. A popular sushi topping, "Tampico", is made by blending chiles, mayonnaise, and imitation crab. Cream cheese and avocado are often added to makizushi. In Brazil, Japanese food is widespread due to the large Japanese-Brazilian population living in the country, which represents the largest Japanese community living outside Japan. Over the past years, many restaurant chains such as Koni Store have opened, selling typical dishes such as the popular temaki. Yakisoba, which is readily available in all supermarkets, and often included in non-Japanese restaurant menus. In February 2012, the Agency for Cultural Affairs recommended that 'Washoku: Traditional Dietary Cultures of the Japanese' be added to the UNESCO Representative List of the Intangible Cultural Heritage of Humanity. On December 4, 2013, "Washoku, traditional dietary cultures [sic] of the Japanese, notably for the celebration of New Year" was added to UNESCO's Intangible Cultural Heritage, bringing the number of Japanese assets listed on UNESCO's Intangible Cultural Heritage list to 22. Japanese obsession with fresh food — which manifested in certain aspect of Japanese cuisine traditions of eating live seafood, which includes Ikizukuri and Odori ebi, has gained criticism — condemned as a form of animal cruelty. Japanese cuisine is heavily dependent on seafood products. Compared to other developed countries, the Japanese eat more fish than any of them, consuming about 27 kilograms of seafood per capita annually. An aspect of environmental concern is Japanese appetite for seafood, which might lead to depletion of natural ocean resources through overfishing. For example, Japan consumes 80% of the global supply of blue fin tuna, a popularly sought sushi and sashimi ingredient, which might lead to its extinction due to commercial overfishing. Another environmental concern is commercial whaling and the consumption of whale meat, since Japan is the world's largest market of whale meat. ^ Demetriou, Danielle (October 19, 2011). "Japan relishes status as country with most three-starred Michelin restaurants". ISSN 0307-1235. Retrieved January 15, 2019. ^ "A Day in the Life: Seasonal Foods" Archived January 16, 2013, at the Wayback Machine, The Japan Forum Newsletter No.September 14, 1999. ^ Hepburn 1888 dictionary "hashiri: The first fruits, or first caught fish of the season"
^ Ehara, Ayako (1999). "School Meals and Japan's Changing Diet" (snippet). Japan echo. Japan Echo Inc. 26. , quote: "Relatively alien to the traditional Japanese diet were meat, oil and fats, and dairy products.."
^ Heibonsha 1964, vol. 17, p.356, "Nihon ryori", section by Motoyama: "日本人の食料はもともと穀類を中心として菜藻を主とし、鳥肉がこれにつぎ、獣肉はわすがであったが、仏教渡来後.."
^ Morimatsu, Yoshiaki; Hinonishi, Sukenori; Sakamoto, Taro (1957). "風俗辞典". 東京堂出版. "天武天皇三年に牛・馬。犬・猿,鶏の肉を食べゐこと古禁じてから肉食が演じ、江戸時代になっても四足・二足を食べない家が多かった。もっとも野獣の肉は食用に供した。"
^ Pulvers, Roger (March 6, 2011). "Japanese families' nutritional values pay dearly for 'progress'". The Japan Times. Archived from the original on August 1, 2012. Retrieved March 22, 2011. ^ Today, What Way. "Food in Japan is not just about Sushi - Japanese Food Adventure". What Way Today. Retrieved April 20, 2016. ^ Shinmura 1976 Kōjien under okazu says "formerly a ladies' term (婦人語)"
^ Andoh 2012, p.20 "spinach steeped in broth"; p.63 "(spinach) blanched and then marinated" in smoky broth. ^ Shimbo 2000, p. 237: "Ohitashi literally means 'dipped item,' although the dressing is actually poured over the leaf vegetables." ^ Tsuji, Fisher & Reichl 2006, p. 429. ^ Nagatomo, Akiko (長友麻希子) (September 3, 2011). "普茶料理". 「京都」×（もっと）ワかる. Industry and Tourism Bureau, City of Kyoto. ^ Andoh 2010, p.188- gives a recipe. ^ a b Kobayashi, Kazuhiko; Smil, Vaclav (2012). Japan's Dietary Transition and Its Impacts. MA, USA: Massachusetts Institute of Technology. p. 18. ISBN 978-0-262-01782-4. ^ Hosking, Richard (1995). A Dictionary of Japanese Food - Ingredients and Culture. Tuttle. p. 30. ISBN 0-8048-2042-2. ^ "What is Shochu?". Retrieved December 31, 2006. ^ Jo, Andrew. "Japanese food includes dishes such as delicious Soba and Udon noodles". Retrieved December 15, 2015. ^ a b "Japan Etiquette". Etiquette Scholar. Yellowstone Publishing, LLC. Retrieved January 16, 2017. ^ Lininger, Mike. "Japan Etiquette | International Dining Etiquette | Etiquette Scholar". Etiquette Scholar. Retrieved October 3, 2018. ^ Golden Rules for Japanese Chopstick Manners, Emiko (November 2009). "10". Japan Talk. ^ Boye., De Mente,; ボイ・ラファイエット・デ・メンテ. (2009). Etiquette guide to Japan : know the rules that make the difference (Updated and expanded ed.). North Clarendon, Vt.: Tuttle Pub. p. 48. ISBN 9781462902460. OCLC 773692744. ^ Davidson, Alan (2003). Seafood of South-East Asia: a comprehensive guide with recipes. Ten Speed Press. p. 34. ISBN 1-58008-452-4. ^ Tsuji, Shizuo; M.F.K. Fisher (2007). Japanese Cooking: A Simple Art (25 ed.). Kodansha International. pp. 280–281. ISBN 978-4-7700-3049-8. ^ Mente, Boye Lafayette De (2007). Dining Guide to Japan: Find the Right Restaurant, Order the Right Dish, and. Tuttle Publishing. p. 70. ISBN 4-8053-0875-3. ^ a b c Seligman, Lucy. "The History of Japanese Cuisine." Japan Quarterly 41.2 (1994): 165. PAO Liberal Arts Collection 1. ^ 『カレーライス』に関するアンケート (in Japanese). ネットリサーチ ディムスドライブ. Retrieved February 1, 2016. ^ Morieda Takashi. "The Unlikely Love Affair with Curry and Rice." Japan Quarterly 47.2 (2000): 66. ProQuest Asian Business & Reference. ^ "The Globalization of Asian Cuisines: Transnational Networks and Culinary Contact Zones". ^ Iris-Aya Laemmerhirt (2014). Embracing Differences: Transnational Cultural Flows between Japan and the United States, Volume 36 of Edition Kulturwissenschaft. transcript Verlag. pp. 102–103. ISBN 978-3-8394-2600-5. ^ a b Azi Fitriyanti (January 25, 2014). "Japanese Cuisine in Indonesia Focuses on Taste, Menus Food Safety". Antara News. Retrieved May 5, 2014. ^ "Taiwan Night Market Snacks". dfll.nchu.edu.tw. Retrieved September 17, 2018. ^ "Burgeoning growth of Japanese cuisine in Thailand". The Nation. September 24, 2012. ^ "Chicken Teriyaki bento set". Ichiban Sushi. ^ "7 Best Japanese Resto in Jakarta's Little Tokyo (Melawai)". Wanderbites. ^ Japanese Food Favorit ala Cafe (in Indonesian). Gramedia Pustaka Utama. ISBN 9789792227284. ^ Media, Kompas Cyber (February 10, 2011). "Okonomiyaki Merambah Kaki Lima - Kompas.com". KOMPAS.com (in Indonesian). Retrieved September 15, 2018. ^ "10 Japanese Street Food yang Bisa Kamu Temukan di Jakarta". Qraved Journal. Retrieved September 19, 2018. ^ Mustinda, Lusiana. "Yang Hangat! di 4 Tempat Ini Ada Oden Enak dengan Harga Terjangkau". detikfood (in Indonesian). Retrieved September 19, 2018. ^ "New: Suntiang, When Padang Marries Japanese Food". Culinary Bonanza. February 6, 2014. Retrieved May 5, 2014. ^ Resty Woro Yuniar (February 21, 2014). "Food Fridays: When Rendang Said 'I Do' to Sushi". The Wall Street Journal. ^ I. Christianto (November 30, 2009). "Enjoying internationally popular Japanese food". The Jakarta Post. Retrieved May 5, 2014. ^ "Yoshinoya Indonesia". Archived from the original on May 1, 2018. Retrieved December 17, 2018. ^ Cheryl M. Arcibal (July 8, 2013). "Latest Japanese resto in town wants to conquer Pinoy bellies with pork and ramen | Food". Philstar.com. Retrieved March 3, 2014. ^ Japanese Diasporas: Unsung Pasts, Conflicting Presents and Uncertain Futures - Google Books. Books.google.com. Retrieved March 3, 2014. ^ Tiu, Cheryl (December 31, 2012). "Best of Manila | CNN Travel". Travel.cnn.com. Retrieved March 3, 2014. ^ "Asian Food and Australia's Changing Palate". Peril Magazine. Retrieved March 26, 2015. ^ "Top 10 Restaurants of Australia". Top 10 Restaurants. Retrieved March 26, 2015. ^ a b "Japanese Culture in Australia". Australian Good Food Guide. Retrieved March 26, 2015. ^ Renton, Alex (February 26, 2006). "How Sushi ate the World". The Guardian. Retrieved August 20, 2006. ^ Passy, Charles (August 26, 2015). "Meet the Pilot Who Doubles as Block Island's Chinese-Food Delivery Guy". The Wall Street Journal. pp. A1. Retrieved August 26, 2015. ^ Claiborne, Craig. "Restaurants on Review; Variety of Japanese Dishes Offered, But Raw Fish Is Specialty on Menu". Retrieved August 3, 2018. ^ "The chef, obsessed: Nobuyoshi Kuraoka established his own local buckwheat farm to achieve the perfect soba noodle". Politico PRO. Retrieved August 3, 2018. ^ Fabricant, Florence. "ADAPTING AMERICAN FOODS TO JAPANESE CUISINE". Retrieved August 3, 2018. ^ "American-style peace redefines Japanese palate". Japan Times. August 30, 2001. ^ "Why Hibachi Is Complicated" (Audio Podcast with Notes). Sporkful. March 11, 2019. ^ Kugel, Seth (November 9, 2008). "Rio de Janeiro: Koni Stores". The New York Times. Retrieved May 5, 2010. ^ "Japanese cuisine to be nominated for UNESCO world heritage list". Mainichi Daily News. February 18, 2012. Archived from the original on February 19, 2012. Retrieved February 19, 2012. ^ UNESCO Culture Sector - Intangible Heritage - 2003 Convention :. Unesco.org. Retrieved on May 24, 2014. ^ "Japanese cuisine added to UNESCO intangible heritage list". Mainichi Daily News. December 5, 2013. Archived from the original on December 10, 2013. Retrieved December 5, 2013. ^ Russell, Jennifer (October 15, 2015). "At least it's fresh! Diners scream in shock when their half-eaten sashimi comes back to life and JUMPS off the plate". Mail Online. ^ McCurry, Justin (November 10, 2016). "Trouble at Tsukiji: world's biggest fish market caught in controversy". The Guardian. ^ "Whale meat trade continues in East Asia". WWF. ^ "Whaling in Japan". Whale and Dolphin Conservation. Hara, Reiko (2006) International Cuisine: Japan ISBN 0-340-90577-8. Heibonsha (1969) . 世界百科事典(Sekai hyakka jiten). (world encyclopedia, in Japanese). Kiple, Kenneth F.; Ornelas, Kriemhild (2000). The Cambridge World History of Food. 2. Cambridge, UK: ColuCambridge University Press. ISBN 0-521-40216-6. Archived from the original on May 4, 2012. Wikimedia Commons has media related to Cuisine of Japan. Wikivoyage has travel information for Japanese cuisine. Wikivoyage has a travel guide for Cuisine of Japan. This page was last edited on 24 April 2019, at 13:03 (UTC).